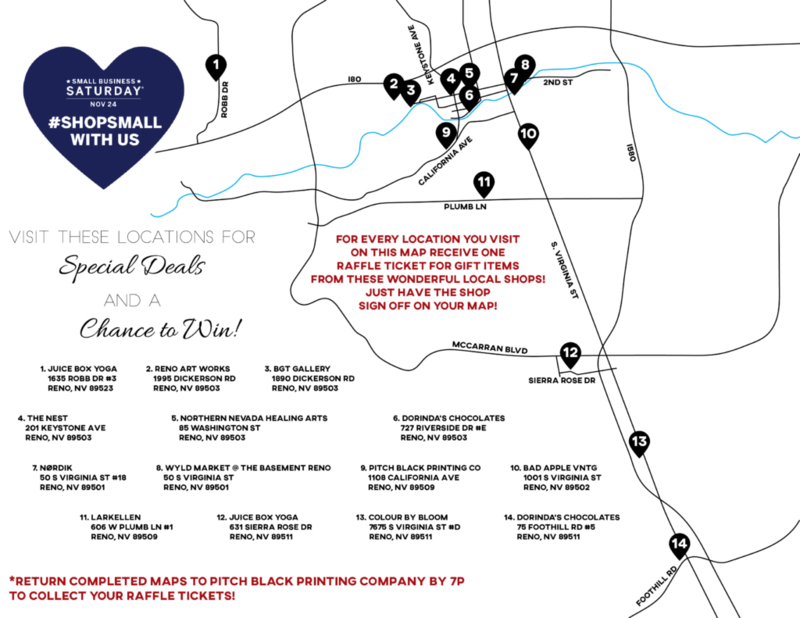 Small Business Saturday | Pitch Black Printing Co. Looking for unique gifts for the holiday season? Avoid the trampling at big box stores on Black Friday and join local small businesses for your holiday shopping on Small Business Saturday. Join local Reno businesses and shop small for Small Business Saturday. Get your holiday shopping done while enjoying special deals and complimentary items from the participating local businesses below. For every location, you visit on this map receive one raffle ticket for gift items from these wonderful local shops! All classes are free for the entire day! Original art made by artists in residence for you to show your creative holiday gift giving, free tie-dyed bags made by Lauren from Prism Magic while they last for any purchase, art demos and “make it-take it” classes happening through out the day, and book a tie dye class or birthday party and get an extra pair of socks included in lesson for each student! Complimentary swag bags while supplies last plus hot cider and treats all day! Boozy hot cocoa and cookie bar plus up to 75% off select items for our biggest sale of the year! From 11a-3p: free chair massages and mini reiki sessions, specials on gift certificates, and complimentary tea/water! Complimentary hot chocolate from their own special recipe! Nordic treats starting at 10am, and a free gift with qualifying in store purchases ($20 value) while supplies last! 20+ local artists, wine, food trucks, free stickers & pins! 10% off your retail purchases or print services, free swag bags and deals offered while supplies last, and don’t miss out on free refreshments! 30% off all vintage clothing and receive a free mystery bag with every $75+ purchase! Find 3-$10 and 1-$25 gift certificate hidden in the store and enjoy complimentary mimosas! $30 chalk paint quarts (save $10), $25 finishing waxes (save $7), 30% off all paint and wax brushes, 30% off all home decor and furniture, candles/soaps/bath bombs Buy 1 Get 1 Free, Buy 1 Get 1 Free chalk painting classes!